Avery Friedman is constantly on the go; she’s a Junior at the University of Michigan double majoring in English and Communications, where she writes about music for The Michigan Daily and serves as the social ventures chair of Music Matters — a student organization that uses music to promote positive social change. Somewhere between late nights in the library unpacking the work of Virginia Woolf and newsroom days reviewing the latest Bon Iver album, Avery recognized podcasts as a uniquely portable and accessible form of media for busy students like herself. This fall, she decided to launch not one, but two podcasts. “I had a love of podcasts that grew last year, when I felt overwhelmed during election season with the amount of stuff there was to read. I downloaded a few shows and I would listen to on the way to class,” she said. A former intern of the Center for Communication, Avery credits her experience at the Center as a kind of awakening to all the resources available for young content creators and storytellers today. Additionally, Avery’s editorial work and strength as a writer led to the exploration of new modes of storytelling. She’s written for the Music beat of the Daily for the past year, where she has covered singer-songwriter powerhouses such as Lorde and Mitski and interviewed established musicians including the members of the Head and the Heart. 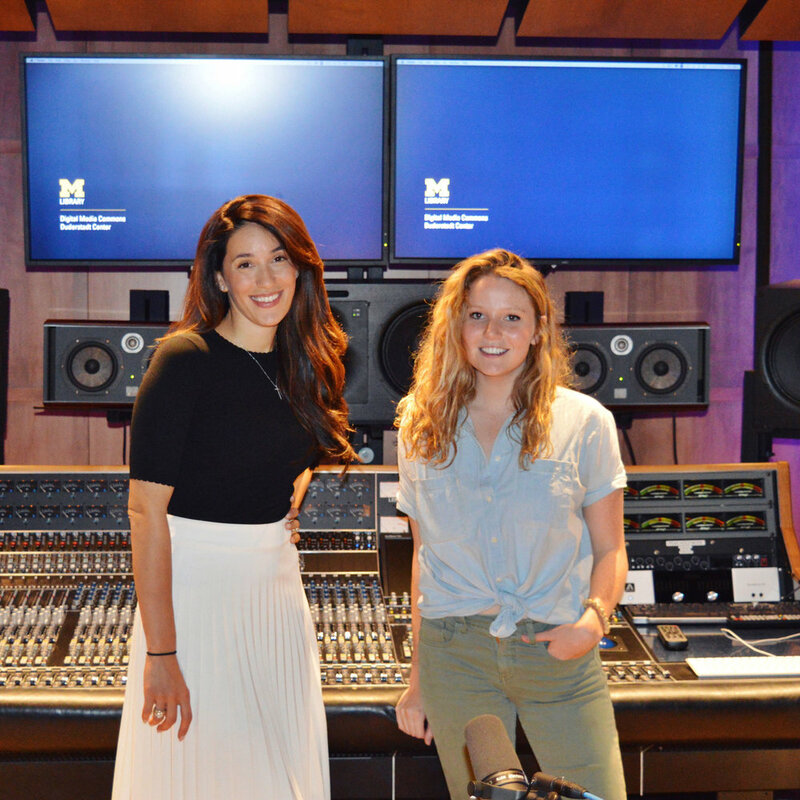 She also demonstrated her editorial chops interning for Global Citizen last summer, where she wrote about the global response to Apple’s hijab emoji and profiled Michigan’s Democratic gubernatorial candidate Gretchen Whitmer. “The act of physically writing is really important, even if you are producing something that isn’t delivered in a written form. It teaches you to go in-depth and be coherent but complex and make sure you’re factual. Being edited has made me really aware of how careful I need to be, making sure to touch on all angles of things. That definitely sparked my love of getting to the bottom of stories,” she said. Combined with her experience interviewing subjects that ranged from the members of the Head and the Heart to leading Democratic candidate for governor, she discovered a desire to take her print storytelling experience into the audio realm, filling what she saw as a “void” in the campus news climate of audio content that students could digest on the go. With the backing of the The Michigan Daily, the University of Michigan’s student-run newspaper, Avery launched “The Sit Down” and “The Daily Weekly.” “The Sit Down” is a long-form interview style podcast with prominent campus figures, as well as individuals in the greater Ann Arbor community. Avery is a longtime fan of NPR’s Terry Gross, and hopes to emulate the soothing, stripped down intimacy of “Fresh Air.” “The Daily Weekly” provides an audio overview of the Daily’s hottest stories of the week, featuring interviews with managing editors of each section (News, Arts, Sports, Opinion, etc.). As the Daily’s podcast manager, Avery is responsible for reaching out to subjects and doing extensive research; for “The Sit Down” this might mean reading up on the elusive Sava Farah, founder of Savco Hospitality, and mastermind behind some of Ann Arbor’s trendiest eateries or Aaron Dworkin, former U of M Dean and President Obama’s first appointment for the National Council of the Arts. For “The Daily Weekly,” Avery gets familiar with the stories in print from the past week and creates a regular interview schedule with participating editors. She builds a narrative arc of questions and with ‘Sit Down’ subjects she keeps it simple. “I just think about what genuinely interests me and what I would want to know.” She does a little pre-show yoga to ease her nerves about sitting in front of the mic and conducts the interview. After collaborating with student audio engineer Ryan Cox to make edits, she makes a final social media post to get the episode out there. On the horizon, Avery is looking to boost analytics and keep creating high quality content that will allow her access to high-profile guests and with every coming week, an even more dynamic story to tell.